Cypress Moon creates beautiful, unfinished wooden furniture that is designed for strength and weather tolerance. 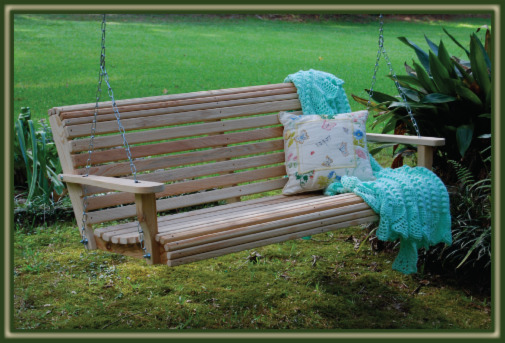 Handmade from Louisiana Cypress trees, these Rollback Porch Swings are naturally beautiful and will accent any front porch! 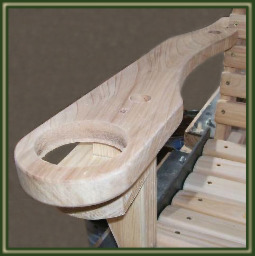 Cypress Moon swings are heavily constructed with slats that are 1 inch thick and 1 3/4 inches wide routered (no sharp edges). 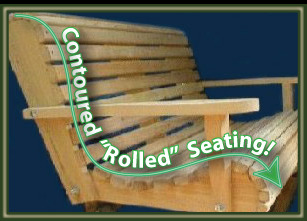 Each slat is finish sanded on all sides and ends for your safety and comfort . In addition, these swings have 4 supports across the back AND 4 across the bottom. Few porch swings are built with this kind of quality support system! Each purchase includes all necessary hardware for a standard porch installation: S-hooks, chains, bolts, and eyebolts. As with all Cypress Moon Furniture, price includes FREE SHIPPING! 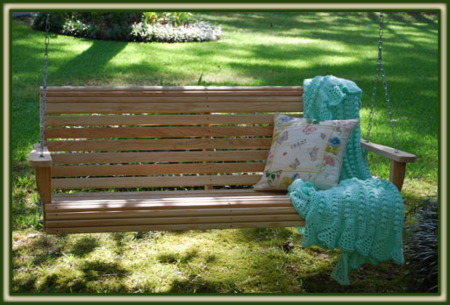 If the more traditional look is what you desire, you might check out our Classic Porch Swing designs. Available in 2ft - 7 ft widths! Dimensions: See the dimensions to all of our porch swings here. WHY COLOR STAINS & NOT COLOR PAINTS? We only offer color stains because the grains of the cypress are too beautiful to be covered up by paint. By staining them we are still able to uniquely accent your swing with color, while allowing the grain to remain visible! PLEASE NOTE: We have tried to the best of our ability to depict the true stain colors on our "Color Options" chart above. However, due to variations in screen resolutions, the stain colors that appear on your monitor may differ slightly from stain that has been applied to actual products. WHY CHOOSE CYPRESS? Cypress wood is nicknamed as the "eternal wood". Cypress has a strong tolerance to environmental elements and has been known as the world's 'wood of choice' for thousands of years. Very few woods match the properties of cypress when it comes to sturdiness and strength. Cypress wood can be easily identified by its handsome, straight grain that portrays a gorgeous array of colors. This unmatchable beauty is enhanced by life long durability. Cypress contains a naturally occurring chemical called Cypressine that preserves and protects it from decay and insects. Because no harsh chemicals are needed to protect the wood, our products are Eco-Friendly and allow Cypress Moon to be labeled as a Green Furniture Company! In addition, cypress has little tendency to warp, twist, or cup. 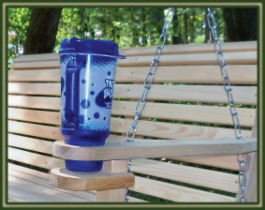 It even matches up to teak wood in outdoor performance, yet cost sometimes 10 times less. Because of its beauty, natural durability, and broad versatility, cypress' popularity continues today! 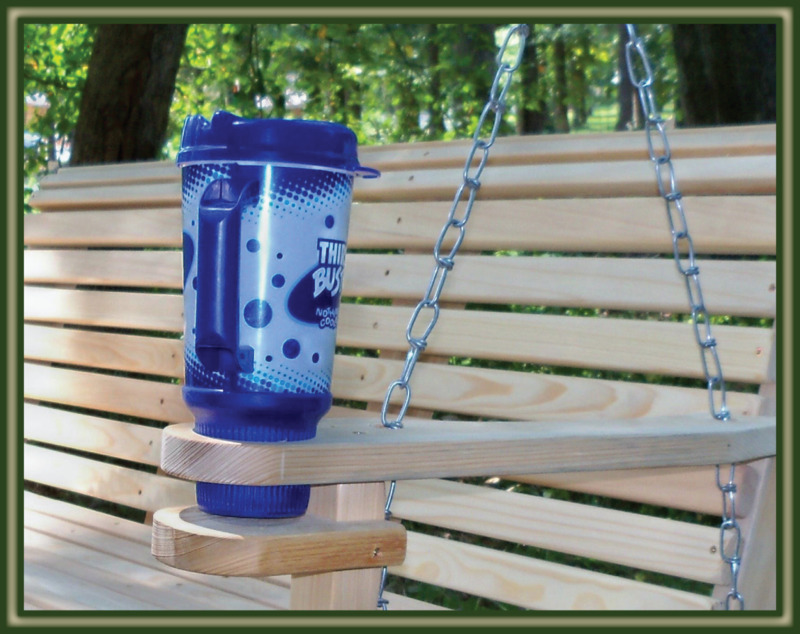 Don't forget to add our Porch Swing Accessory: Swing Mate™ Comfort Springs! "w/ Color" under the OPTIONS menu.